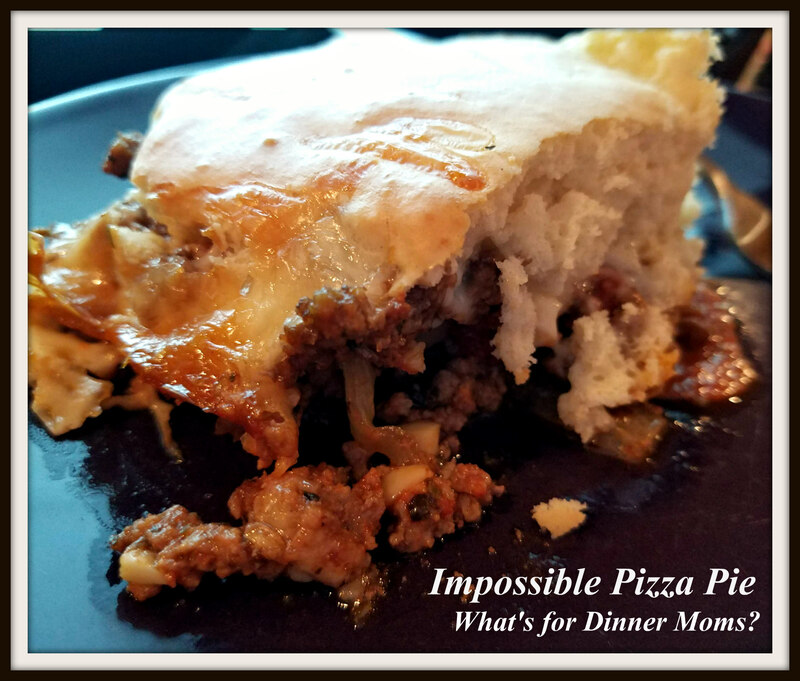 Impossible Pizza Pie – What's for Dinner Moms? 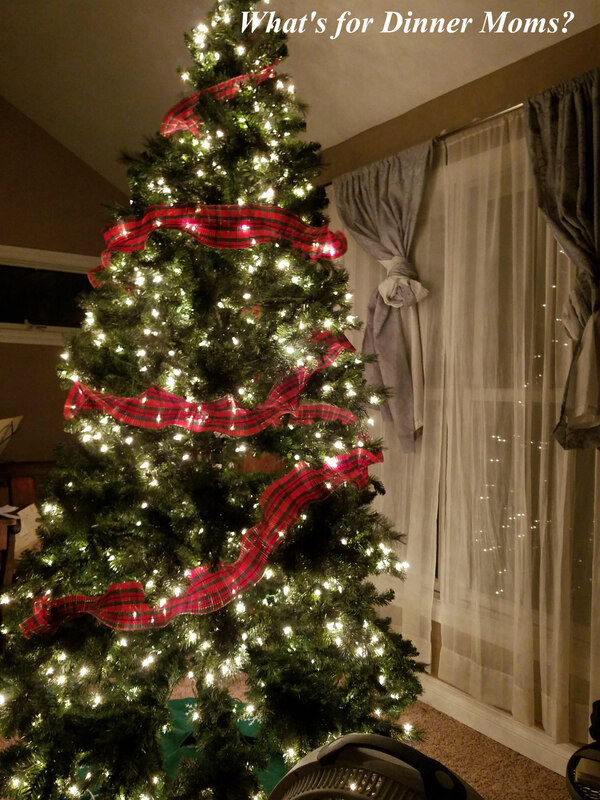 We finally put our tree up and lit it! It has no decorations but at this point I am okay with that. We opened the curtains so you can see it from outside and it looks pretty. I love lying in bed at night and taking my glasses off to look at the lights. The big fuzzy balls are so pretty. I am glad we at least got the tree up and lit. I would feel horrible if we didn’t put it up. The kids keep their advent calendars underneath the tree. I don’t want it to be family lore someday with my kids – Remember the year we didn’t decorate for Christmas? Ugh. When my kids were little they used to love Impossible Cheeseburger Pie. I haven’t made it in years. We bought a box of Bisquick back a while ago and I ran across it in cleaning up the pantry. I wanted to use it up so we used what we had on hand and made an Impossible Pizza Pie. I wouldn’t say this was a super mega-hit like some other dishes but we all agreed it was filling and made good use of the items we had on hand. The kids liked the flavors and immediately started making suggestions for items to add next time – olives, banana peppers, additional cheese…. Make this your own. Taste the sauce and add the spices that make it delicious for you! Add a side salad to complete the meal! This dish makes a filling dinner that you can customize for your family. Preheat oven to 350 degrees. Spray a 13 x 9 casserole dish with non-stick spray. Set aside. In a large skillet brown Italian sausage over medium heat breaking it into small pieces with the side of the spoon while cooking. Drain fat from pan. Add garlic and onions to pan. Stir well. Once onions start to wilt and become brown around the edges add tomato sauce and spices to the pan. Taste and adjust spices to your liking. In a bowl mix Bisquick, half and half, and egg together until well blended. In the casserole dish spread the sauce in the bottom of the pan. Layer the pepperoni slices over the entire casserole dish overlapping the slices. Sprinkle with 2/3 of the cheese. Drop the Bisquick mix by teaspoons around the top of the casserole. Carefully spread to cover entire top. Sprinkle remaining cheese over the biscuit topping. Bake for 30-35 minutes until center springs back to touch. Remove pan from oven and let sit for 3-5 minutes before serving. Ike to try it is as a one pan recipe in a cast iron skillet. I’d also like to try swapping out the bisquick batter for some store bought pizza dough. A couple of other ideas: Chicken tikka masala with a no-yeast Indian flatbread dough, a spinach and ham filling, or a traditional pot pie. I’m gonna try the pizza first, since pizza is the world’s perfect food! Thanks for this versatile and easy recipe! That a nice looking tree, Marci and that pizza pie looks like a mouth full! This tree looks absolutely beautiful. It doesn’t need more decoration.